Friends of Bob present Habib Koité on February 22, 2014 at Duncan Hall in Downtown Lafayette. Tickets on sale now. Friends of Bob live music co-op presents Habib Koité on Saturday, February 22 at Lafayette’s Duncan Hall. Koité is a solo singer, songwriter and guitarist, based in Mali. His band, Bamada, is a supergroup of West African musicians, including Kélétigui Diabaté playing balafon. 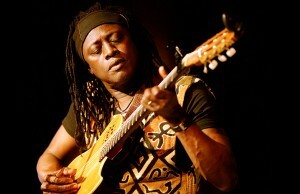 Koité is known primarily for his unique approach to playing the guitar by tuning it on a pentatonic scale and playing on open strings as one would on a kamale n’goni. Other pieces of his music sound more like the blues or flamenco which are two styles he learned under Khalilou Traore. Koité’s vocal style is intimate and relaxed, emphasizing calm, moody singing rather than operatic technical prowess. Members of Bamada play talking drum, guitar, bass, drum set, harmonica, violin, calabash, and balafon. Koité composes and arranges all songs, singing in English, French, and Bambara. Tickets will go on sale in January and are $14 in advance, or $16 day of show. Tickets are available at Von’s Records, JL Records, Don’t Think Twice Records, and McGuire Music. Please provide your name, address, phone #, and e-mail address.